They usually like to live in low temperatures, preferably, less than 8 degree Celsius. 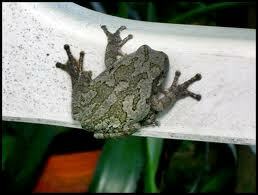 They are also popularly known as the North American tree frog. One cannot differentiate between gray tree frog and copes gray tree frog. They can only be identified by their calls. This is really an exhilarating topic for a tree frog analyst. The gray tree frog belongs to the category of the tree frog. Both of them look alike. 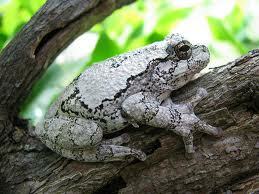 The gray tree frogs mostly dwell in parts of eastern USA and central divisions in southeastern Canada. It were the European frog experts who coined the name of the gray tree frog. 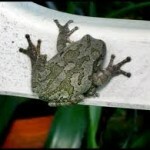 They are often also referred to as the eastern gray tree frog, common gray tree frog etc. These species is small yet they have an awesome ability to change the skin color between ray to green in their smallish structures. They are sexually present in two forms. The males are smaller than the females. You can easily segregate males from females by checking the color around their throat. The male has black grey colored throat while the females do not produce the croaking sound. Initially, the juvenile ones are green in color; they become gray colored as they attain adulthood. 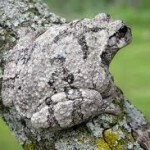 Color of the gray tree frog: These species have an astounding capability to camouflage themselves. Infact, the change in color depends on the surface on which they have been sitting. Moreover, skin of this tree frog variant is very rough and has a pattern of a marble on it. When these species leap, their hind legs dotted with bright yellow orange blotches become visible. 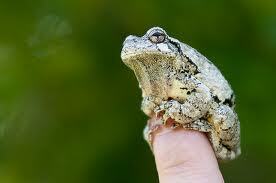 Size of the gray tree frog: The size of the gray tree frog varies between 3.8 to 5.1 cms. Toe pads of the gray tree frog: These species have strong toe pads that help them to climb the trees. These species prefer to dwell in the forested areas & shrubs. 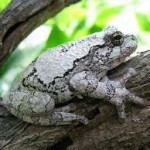 The gray tree frogs are mostly found in the eastern USA and parts of central Texas. They are also common in parts of Qubec, Manitoba, Ontario. The gray tree frogs like to have invertebrates and insects as a diet. In addition to this, they like to feed on worms, silkworms and crickets. The mating season usually starts from spring and continues up to summer in most places. However, in Texas, the time of the mating season starts from March and continues up to May. During the period of mating season, the males prefer to relax in shrubs always close to the water. The females seldom make visits to the ponds except when they are expecting to lay eggs .The female counterpart always like to lay eggs in temporary water areas like ponds, rivers and ditches. The eggs once laid cling to the vegetation that is under water. Overall the females lay about 2000 eggs. Each egg takes about 4 days, on an average, to hatch, and rely on the temperature of the area. The juvenile ones transform generally within 2 months. 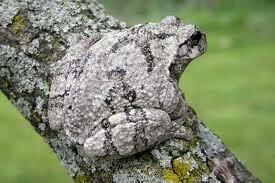 The gray tree frogs usually prefer to come out during the nighttime and like to reside on the top of the trees. They are on the earth only during mating season. Their outstanding capability to camouflage helps them to protect themselves from predators. Moreover, they also possess bright yellow colored blotches on the inner portion of their thighs that match the sunlit grass. These species always hibernate in the roots of the trees or leaves in the months of winter.Their bodies are so uniquely designed that they can resist a temperature of 8 degree Celsius. In order to prevent the cells from getting damaged due to the formation of ice crystals on the skin, their body releases a chemical called cyroprotectants. Additionally, their body also produces glucose that helps the organs from freezing. These species are easy to manage and should be kept in at least a 15 gallon water tank. These creatures always like to move around so it is necessary to have large space for them. An environment which is congenial to their health is desirable. The same can be easily done with assistance of small sticks & plants. In the bottom of the tank, it is good to use fiber from coconut or potting soil. The gray tree frog can be easily fed on crickets, flies and other insects. Water provision needs to be so designed that their bodies are well hydrated. Proper humidity level needs to be maintained. These species prefer to stay in wet areas. Therefore, humidity level preferred should be anything above 60 %. The gray tree frog cannot withstand a temperature more than 80 degree Fahrenheit. A good arrangement of UV lights is preferable to allow plants to grow well within the tank. Try to provide them a serene environment and keep them away from direct rays of sunlight. 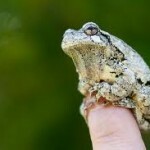 Interestingly, the gray tree frog should be kept away from the television. These species live for about 8 years. These species are not threatened.